Today, I'm happy to re-introduce Joni Parker. She has previously appeared on Authors to Watch and I'm thrilled that she's come back to share her newest release with us. Welcome, Joni! Can you tell us a little about yourself? In 1998, I retired from the U.S. Navy with 22 years of service. My husband and I moved to Las Vegas, Nevada and bought a house. However, we fell in love with a motorhome and sold our house. We spent several wonderful years criss-crossing the U.S. including a trip to Alaska until my husband passed away in 2001. Not long after that, I went back to work for the federal government and learned to live my life over again. I retired for a second time in 2010 to devote my time to writing. I had my first feature article published in the school newspaper when I was in the first grade. After that, I wrote short stories and poems through elementary school. When I got to high school, all that stopped and I didn’t start writing again until I was 57. It was a long dry spell. I enjoy the fantasy genre because it allows me to create my own world and populate it with the people I want. Sometimes, my characters are mere mortals, but they can also be Elves, Dwarves, Titans, or other creatures. My latest book is called “Spell Breaker: The Chronicles of Eledon Book One.” For a thousand years, no one has been able to leave Seaward Isle because of a spell that created a ring of storms around the island. As the book opens, Lady Alexin Dumwalt (Alex) uses her magical powers to break the spell and frees the inhabitants to escape to Eledon, the World of the Elves. But her success will come at a cost. The most challenging aspect was keeping the book size manageable. I kept adding more details along the way and had to keep cutting the book back. As it is, it’s the longest book I’ve published so far. This is like asking which child is your favorite. “Spell Breaker” is now my favorite because it presented so many challenges. The first draft my editor received was significantly different than the final version. It took me an extra year of editing to get the book the way it ended up. I used what I learned to change “Blood Mission” (Book Three of the Seaward Isle Saga, the previous series) before it went into print form. Then I withdrew the first ebook version and published a second edition. Not intentionally. My main character is still very young so she’s learning as she goes. Lessons and themes come out of it. 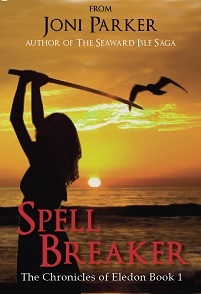 In “Spell Breaker,” she learns some very important life lessons the hard way, like the need to give and take, especially when she argues with her grandmother. My goal is to become a better writer and utilize my brain for as long as I can. Writing doesn’t have a mandatory retirement age, so I intend to write for a long time. Last year, I attended a seminar by Donald Maass. He owns a literary agency and has written several books on writing a good novel based on what he looks for as an agent. The seminar was three hours long and was held before the DFW Writers’ conference. In addition, he also taught several breakout sessions and gave the closing speech. I bought two of his books, “The Fire in Fiction” and “Writing 21st Century Fiction,” but I also found his “writing the BREAKOUT NOVEL Workbook” to be very useful. If anyone has a chance to attend one of his seminars, do it. You’ll be inspired, too. I’m working on book two of the Chronicles of Eledon. It’s with my editor now. I also have drafts of the next two books in the series that are nearing completion. I’m also toying with a memoir and considering a historical fiction novel. Rewriting can be one of the most creative aspects of writing. I know there are some authors who hate it, but I love the process. Sometimes, I come up with better ideas the second or third time around. Joni was born in Chicago, Illinois, but her family moved to Japan so her father could pursue his dream of becoming a professional golfer. Her dad achieved his dream and the family returned to the U.S., settling in Phoenix, Arizona. Joni graduated from Camelback High School and attended Arizona State University until she dropped out and joined the Navy. She completed a three-year hitch in Naval Air Station Lakehurst, New Jersey and got married to the love of her life. At first, she followed her husband’s career and returned to college, attaining a Bachelor’s degree in Accounting and an MBA. A few years later after her husband’s retirement from the Navy, she returned as a commissioned officer, completing 22 years of active duty service. While in the service, she also earned another Master’s degree, Master of Military Arts and Sciences, from the U.S. Army Command and General Staff College. In 2001, her husband passed away and Joni went back to work for the federal government in a civil service job until she retired for a second time to devote her time to writing.